Scores seem a bit mixed this week. Many coaches had pretty good scores but their overall ranking still moved backwards. This suggests par score was quite high. As the following graph shows the total amount of points available was slightly less than average, although it was an improvement on the previous 2 weeks. The number of hundreds was about average as indicated in the graph below. 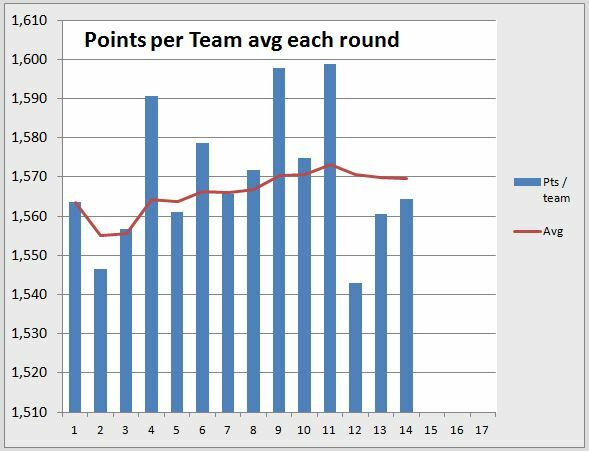 So my explanation for the high par this week, without excess points on offer, is there is a difference in team improvement. Some coaches have teams full of premium players, others are still relying on a few middle ranking players on their grounds. Richmond is again a high scoring loser, scoring 120 more fantasy points more than Sydney. Freo and Port took the biggest shares of the game points – scoring 320 and 450 more points than their opponents. Geelong and Gold Coast was the most unexpected game. Normally Gold Coast scores low, but scored high this week. While Geelong is normally a high scoring team that doesn’t give away many points – but that was also reversed this week. The updated table of average fantasy points scored and conceded by each team is below. I’ve added more new columns – headed Ts/Ks. This is ratio of individual 100s (or tons) to 1000s of team fantasy points (or kilos), for each team. Essendon, Hawthorn and Port are fairly solid at the top. The next group down to Richmond are all close together and swap around a bit. 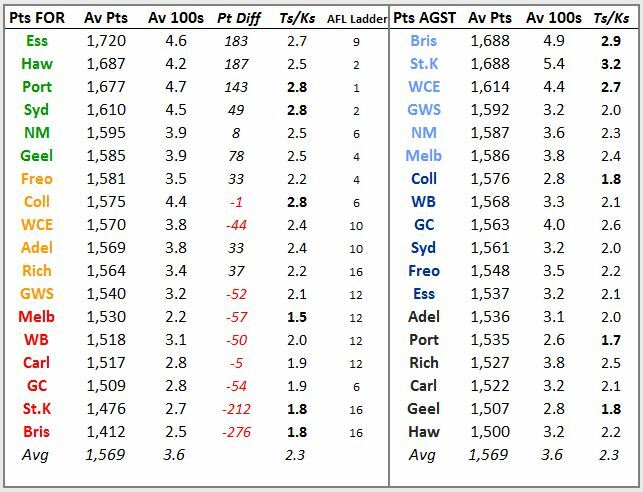 Essendon, Richmond and Gold Coast are the teams whose points are most different to their AFL ladder position. 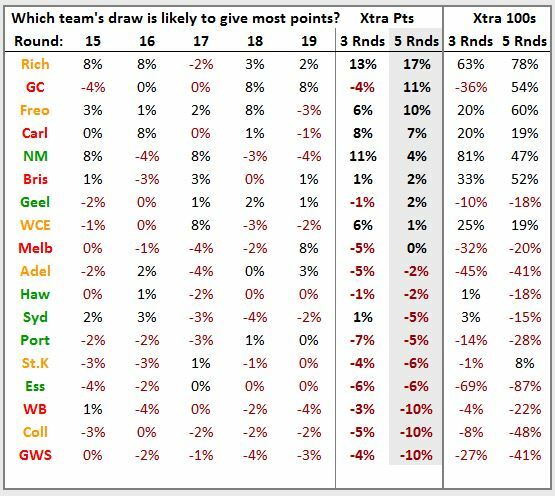 Brisbane and St.Kilda remain at the bottom with low shares of points, giving over 200 extra points to their opponents each round. I expect the teams with higher Ts/Ks ratios such as Essendon, Port, Sydney and Collingwood will provide more consistent fantasy premium options because they need less team points to produce tons. Conversely teams with low ratios such as Melbourne, St.Kilda and Brisbane will be less consistent producers on tons. St.Kilda and Brisbane still concede most points, and approx 5 hundreds a game. West Coast, GWS and North are the next 3. Melbourne is trending upwards and is now less defensive than at start of the year. Carlton, Hawthon and Geelong remain the least generous teams. Teams with high Ts/Ks ratios such as St.Kilda, Brisbane and West Coast will be more consistent in giving up tons, even when these teams play well. 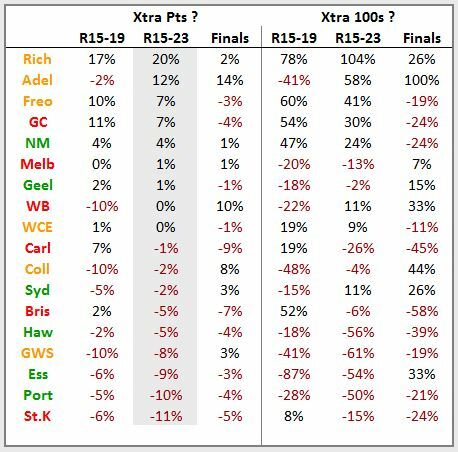 Conversely games against Collingwood, Port and Geelong, with the lowest Ts/Ks ratios should be treated with caution. Do we need a Doggie Bag or a Packed Lunch? So which premiums should we bring in that will go straight to the head of the table and start carving? Also which of our non-keeper players with questionable appetites might struggle when faced with a few weeks of slimmer pickings? The following table shows which teams are likely to get extra (or less) points compared to if they played the average team. Richmond have moved to the top and have good games coming up against St.Kilda and Brisbane. Of the highest scoring teams (green teams) North and Geelong have the best runs. The other green teams are in the bottom half of the table. Freo, Richmond and North are the teams that offer the most potential. Collingwood is finally off the bottom, now second bottom. These projections are applicable to both AFLFantasy and RDT. However, Fantasy coaches are more able to take advantage of changing player scoring levels, and subsequent price changes, simply because they have more trades to exploit the situation. The extended analysis for the rest of the fantasy year including fantasy finals is in the table below. Richmond, Adelaide and Freo are at the top with the best percentages of any team. North and Geelong are best of the high scoring green teams. 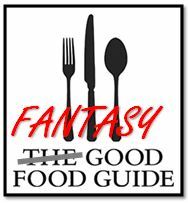 Big fantasy teams Sydney, Hawthon, Port and Essendon are all towards the bottom of the table. Teams battling to get into AFL Finals, or a more favourable spot, will be going flat out and play their best team. Teams with a secure spot in the AFL Finals are likely to rest star players. This tactic appears to have benefited Hawthorn and Freo in past years so we should see it repeated, particularly if playing away and players would have to fly interstate. Teams lower down ladder and outside of AFL Finals contention will play their kids, send star players for early surgery and give club veterans farewell games. 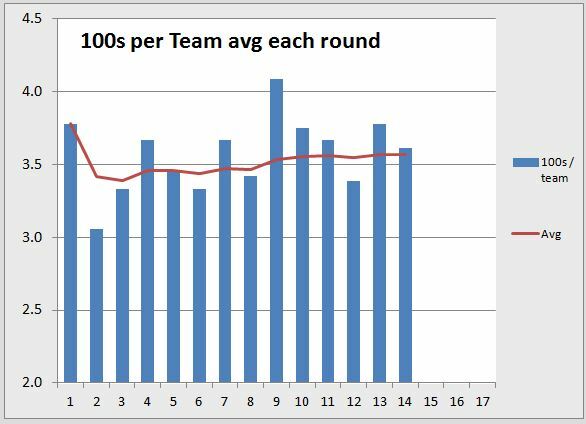 So in my view the team scoring percentage methodology that is the basis of this article will be more reliable and useful in the rounds leading up to the finals, than in the last few rounds of the fantasy finals. That’s it for this week. Please make comments below or hit me up on twitter @NixTrader. Hopefully you all got onto Stephan Martin last week and put him into a starting position on your ground. There were a few doubters about how he would go against Sandi and Freo. But as predicted his game held up well with 111 points against Sandi, who only got 90. His stats confirm he does a lot more than just rucking – 10 kicks, 10 handballs, 2 marks, 25 hitouts and 9 tackles. This week I’m impressed by Anthony Miles with Richmond’s run over the next few weeks. I got him last week and he scored 117. Still only $351k, I think he is going to be very useful M8 if you need one and long term M9. Awesome work as always mate. Bringing in Miles this week for bench cover but will probably field him against the lions and saints! Feeling more confident now after having S Martin produce at F6. What are your thoughts on Jelwood gaining mid/fwd next week when they make the DPP changes? It probably won’t happen but I think he’s a chance. I planned to get rid of him this week but I want to hold him 1 more week just incase he does. Big game changer if we can sit him in the fwd line. J.Selwood would be handy as a forward as his quiet games would be OK there. But I’ve got no info on position heatmaps or anything like that. Warnie and Freako are the people who might be able to give you some info if you ask them. I’m pretty keen on playing Miles over Jelwood this week due to form. Talk me into/out of it! What are the priorities this week? Langdon is definitely being traded but want to keep it under $450k – pick one of Houli, Birchall, Harbrow? 2nd trade is it more important to trade Bock to Kersten or upgrade Murphy (who I’ve been trying to move for a couple of weeks and is double this round) to premo under $560k – Goddard, Libba, Treloar, Stevie J? I would keep Murphy, there is more value in Kersten, plus Murphy will be fresh. You can use the money you make to upgrade Murphy later on to Goddard or Libba or even SJ will also storm home I’m expecting. Mundy, Ebert or Dyson ??? Better options.. i’m actually getting rid of Ebert next week. Don’t trust him.